Cut the squash open, seed it, and cut into slices. Place this on a baking pan with the garlic, drizzle with olive oil, and toss to coat. Bake at 350 for 20 minutes until soft and just beginning to turn golden. Cool and peel, then process the vegetables in a food processor until smooth, along with 1/2 cup chicken broth. Keep this warm. While the squash is baking, sauté leeks in olive oil until soft and lightly browned, 8 to 10 minutes. Add the prepared squash to the pan and simmer over low heat, about two minutes. Stir in 1/2 cup cheese and season with salt and pepper. While pasta is cooking, heat vegetable oil in an 8- to 9-inch skillet over high heat until it shimmers. Add the sage leaves and fry until crisp but still green, under 30 seconds. Transfer to paper towels to drain. Drain the pasta and add this to the squash mixture in a large bowl, thinning with warm chicken broth if it's too thick. Decorate with a few of the fried sage leaves, and serve the others on the side with extra cheese. We’re so thankful to all of our readers who visit Mystery Lovers Kitchen and share our love for food, mysteries, and foodie mysteries. So we’re celebrating you, our fans and friends, by giving away a book. I’ll send out a copy of DEATH WITH ALL THE TRIMMINGS to one commenter. Tell me the one Thanksgiving dish you can't live without. Remember to leave your email. Burdette infuses the mystery with Key West spirit and holiday fun along with delicious food references and recipes. This strong series continues a unique blend of island mayhem and sparkling characters surrounding a layered mystery. And if you haven’t settled on your Thanksgiving menu yet, visit our page chock full of Thanksgiving recipes: Savor the Season! I love the traditional Thanksgiving dinner and it just wouldn't be complete without the cranberries. I'm with you on that one, Sue! cranberries all the way. What an interesting recipe. I am going to have to try this. The dish I can not live with out would be the dressing/stuffing. You and my family, Babs! I love it all, but without the stuffing and cranberry sauce, I'd just have to stay in bed. LOVE the new book!!! Quite a lot of excitement in the story. Love this series and can't wait read this book. Can't live without the dressing! Believe it or not, when I was younger I didn't like dressing (which we've always called stuffing even though I now cook it separately) but at some point I came around and now I love it! Looking forward to it! 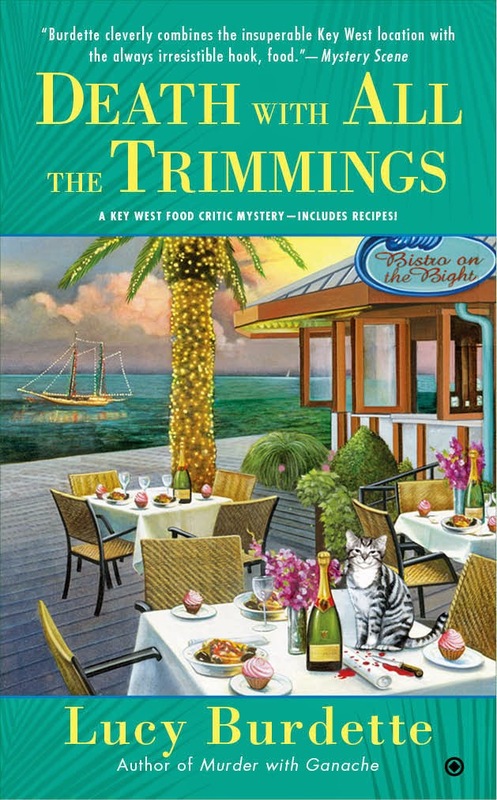 Love both your series but Gourmet De-Lite Mystery series my favorite!! This looks delicious and the new book even more delicious! Oh, yum! I adore apple pie. I make with a gluten-free crust and it's delicious! You guys always make me SO hungry! I'm looking forward to Thanksgiving dinner, especially dressing. Me too, Patricia! Even though we celebrate in October up here in Canada, we'll do it again on Nov 27th. Did you see Cleo's recipe, given to her by a fan? Wow! With pecans and lots of brown sugar. My mom's mashed potatoes are like love on a plate and remind me of so many good times. I am a HUGE mashed potato fan! I could eat a whole bowl of them for dinner and be very happy! We've all about the savory in gravy too, Kuzlin! Cranberry sauce and green bean casserole. My daughter always insists on the green bean casserole! I will have to try adding the dried cranberries to mine. My newseries, which debuts in August 2015, called Cranberry Cove, takes place on a cranberry farm! Sausage and cranberry stuffing. Has both sweet italian sausage and pork breakfast sausage along with dried cranberries soaked in cider. And I only make it for Thanksgiving.